And because the truth is so funny, I would always burst into laughter. As a mother, I do feel like I am losing it sometimes! Losing my memory, for one. Just this weekend it struck me that it’s been at least a year (or two?) since I’ve made one of my favorite soups. It’s a blended soup made with zucchini, spinach and basil, which may sound like a strange combination, but they’re just lovely together. Promise. Perfect timing, too: With summer here, fresh zucchini and basil are plentiful in Texas, so this soup is definitely going back on our regular menu! There’s so much to love about this soup! For one thing, the ingredients (onion, garlic, zucchini, spinach, broth, and basil) are all affordable, accessible, and chock-full of vitamins. Even better: The finished product is — at once — light and delicious and warm and comforting. The best part? I think it’s the garnish … the finely ground toasted pecans, which add a rich, nutty flavor, plus extra protein and a satisfying crunch. You can add grated Parmesan cheese, too, for additional yumminess! In a large pot or Dutch oven, cook onion in oil over medium heat, stirring occasionally, until softened, about 5 minutes. Add garlic and cook until fragrant, about 1 minute. Add chopped zucchini and 1 teaspoon salt. Add 3 cups broth or stock (save remaining 1 cup to add, if desired, after blending). Cover and simmer until zucchini is cooked through, about 10 minutes. Add 3 cups baby spinach and cook until wilted, stirring occasionally, about 3 minutes. Add 1 cup basil leaves. Stir and continue to simmer, uncovered, about 5 minutes. While soup is simmering, toast pecans in a dry skillet over medium heat, about 4 minutes, stirring often to prevent burning. Place toasted pecans in small food processor. Process pecans until finely ground. Transfer to small serving bowl and set aside. Remove soup pot from heat. Using a large ladel, transfer half of the soup to the bowl of a large food processor or blender. (Be careful when moving and blending hot liquids!). Process soup until pureed and smooth. Transfer to a separate bowl. Repeat with second half of soup. Transfer all soup back to the original pot for serving. Taste soup for seasoning and texture. Season with additional salt as needed. You can also add the remaining 1 cup veggie broth now if you prefer a thinner soup. Then serve soup, warm, in small bowls (or coffee cups!) with a sprinkle of ground pecans (and parmesan cheese, if desired) on top. Store left-over soup in a sealed container in the refrigerator for up to 3 days. During warmer months, soup can be served room-temperature or even chilled, like gazpacho. 7 Responses to My Favorite Summer Soup! Can’t wait to make this, Marie! Looks wonderful! Just made this – was WONDERFUL. Picky 8 year old even ate it :) Didn’t have pecans, so subbed out toasted pine nuts. Looking forward to leftovers tomorrow cold! Great use for all the basil growing in my garden. Im Wendy Thompsons aunt who visited you with my sisters a few years back! 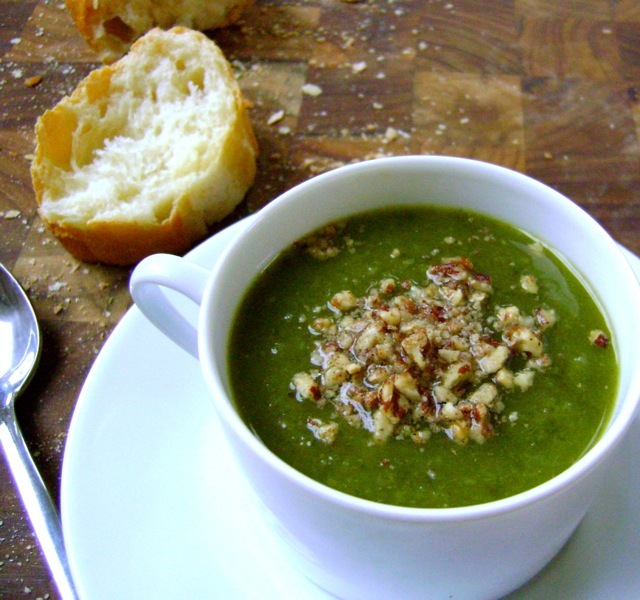 I just made the zucchini basil soup and woW! We loved it! even my husband was surprised! I am growing a few basil plants and zucchini is cheap these days so I had everything on hand! I should have browned the pecans in the oven cuz I burned a few ( and ate them) but thought the nuts and parmesan a great touch! !